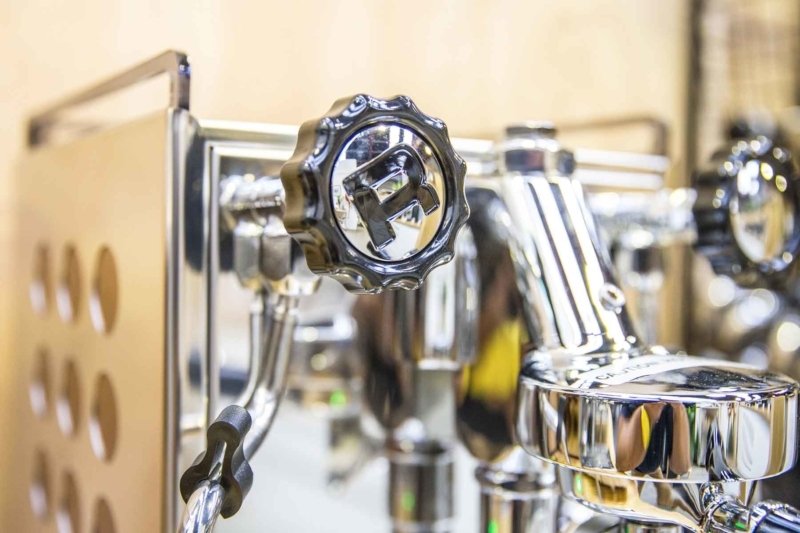 Over time coffee oils, fats and sugars will coat the internal workings of your espresso machine and portafilter. If not cleaned this will lead to poor quality coffee and the inner workings of the group will leak or seize. We see this all the time and it’s easy to avoid. The below instructions are advised to be done daily for commercial use. For domestic machines being used most days, we recommend to back flush twice a week. Note that not all machines are capable of being back-flushed. For this the machine must either have a 3-way group solenoid, or be a 3-way manual lever group like an E61. While running water from the group, brush the group dispersion screen and head seal thoroughly until clean. Ideally, this is done after every shot. At the end of each working day, you need to back flush the group heads. This breaks down the coffee residue and oils in the dispersions screen as well as the group internals and valve/s. Using a blind portafilter basket (coffee basket with no holes), place one teaspoon of Espresso Ninja cleaning salts into the basket, dissolve in hot water, and insert into the group head. Turn on the group and let it run for 20 seconds or so, then turn it off. Leave the portafilter in the group and repeat this process several more times. Next remove the portafilter from the group, turn on the group and flush the blind basket clean. Keep the group running until the water becomes clear. Re-insert the empty blind basket into the group head. Turn on the group and let it run for 20 seconds, then turn it off. Repeat this process once more. Finally, remove the portafilter from the group, turn on the group and let the water run for 10 seconds. The group is now clean. Note – You should NOT need to remove the dispersion screens from the groups, unless your machine is designed so- with a screw that retains the dispersion screen. Doing this could damage the screens unnecessarily. If you backflush each day, they will stay clean. At the end of each day, you need to soak/clean the portafilters and baskets. Use 2 teaspoons of Espresso Ninja coffee cleaning salts and mix into a jug/bucket with warm water. Remove baskets and springs from the portafilters. Place these in the solution, making sure the plastic handles are not submerged in water. Leave for 10minutes to soak. Remove from the solution and brush clean in warm water. Reassemble and place back into the groups. Using a large stainless milk jug, mix 2 teaspoons of Espresso Ninja cleaning salts and hot water. Remove the drip tray from the machine and CAREFULLY pour the solution into the drain box. Clean the drip tray. Refit drip tray to machine. This will break down the coffee residue/oils that have been pouring into the drain hose and mains waste all day. This will help to prevent blockages. If the steam wands have hard milk on them, don’t scrap it off and ruin the wand surface. Run a cloth under hot water and wrap around the dirty steam wand. Leave this for a few minutes to soften the milk. It should now come off the wand easily. If not, dip the cloth into an organic milk cleaning solution, available from the Espresso Ninja shop. This will quickly break down the milk on the wand. NEVER SOAK THE WAND IN ANY WATER. THIS CAN CONTAMINATE YOUR BOILER AND LEAD TO EXPENSIVE REPAIRS. Over time minerals in the water inside your coffee machine will accumulate and settle in the water heaters and pipes. This can have a disastrous effect on your machine, and your coffee. Taking care of it is easy. Different areas have different amounts of minerals in the tap water making it better or worse, but it’s a good idea to descale your machine once a year to keep it clear. You can buy a packet of descaling agent from our shop and do it yourself. It’s cheap, easy and the instructions are on the packet.